I don't know if other bloggites do this, but I have an 'inbox' where I put new finds, things that people give me, and generally anything that pops into my inventory. I name this folder optimistically after each month -- this one is called 'March', and yes, it still has stuff in it from November (and let's not talk about the Halloween hunt items I just found). Then, I put things on. This outfit is the result of 'Oops, right, some gorgeous Fleur skins. Oh shoot, those socks, I remember those. Camp chair boots. Samurai hair. Oh right, cool bag thingie, I bet it would contrast well with this flower/hat/whatever it is. THIS LOOKS TEH AWESOME RITE? KEEN." Of course, I mostly look like a complete mess, but don't pay attention to me, look at all the neat stuff! The new skins from Fleur are in the Shoujo line, very light makeups for Spring (good Bunny Hopping skins). The dress is one of my favorites from the new things out at PixelDolls, and on so many layers that even Hethr Engle approves. 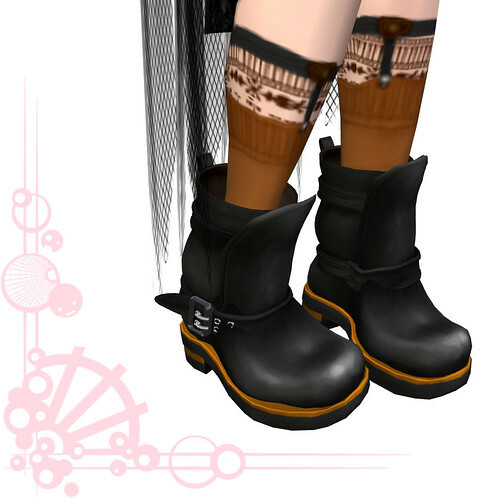 The boots and necklace are items I camped for at Edge Grafica after a tip from Helena Stringer, and the bag is new from Elegance Hats. I quite like the big bulky look, and it contrasts nicely with the floaty flower hat.